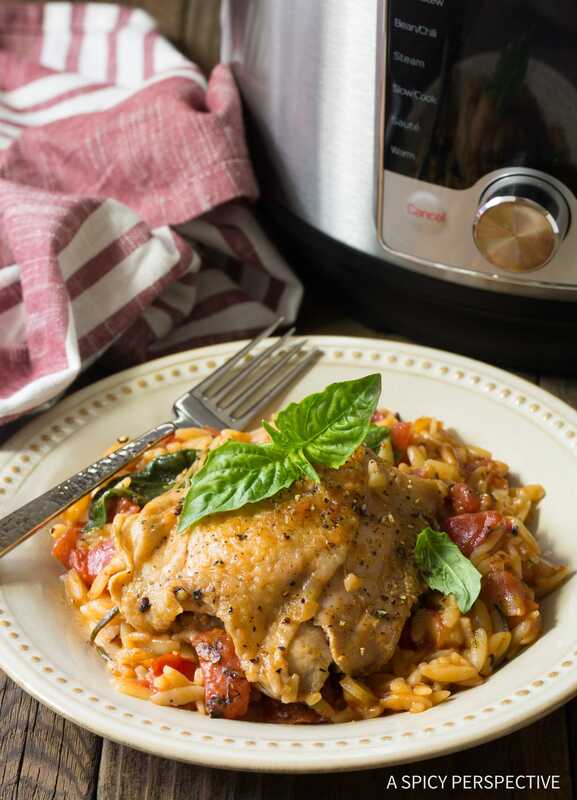 This cozy Instant Pot Herb Chicken Orzo is a quick Italian meal your whole family will love. Sometimes I just need a little edible comfort in the form of pasta. Who’s with me? Even in the summer, when I’m supposed to be sticking to barbecue and watermelon, I’ve got to have a carby pasta dish on occasion. It just makes me feel like all is right with the world. 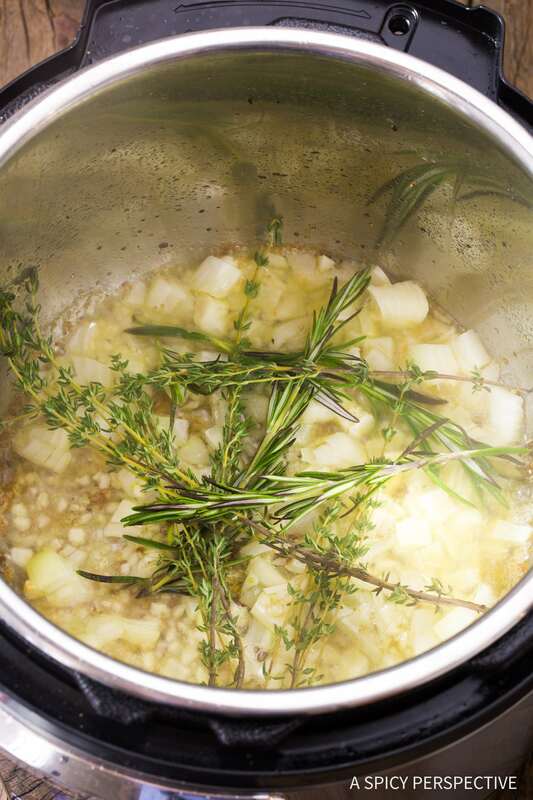 Today’s Instant Pot Herb Chicken Orzo is a fabulous recipe year-round, yet I especially like to make it in the summer and early fall when my herbs are growing tall. 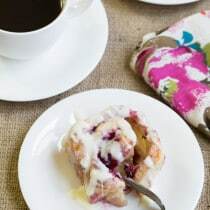 It’s also great for summer cooking, because the entire recipe in made in an Instant Pot, so you don’t have to turn on your oven or stovetop and heat up the house. 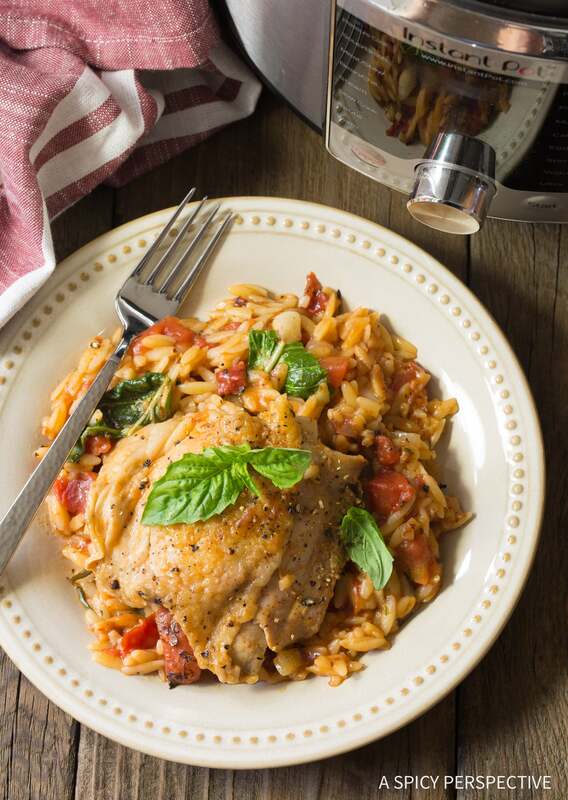 However, I have found with recipes like this Italian Chicken Orzo dish you can pressure cook your chicken to tender perfection, and boil your pasta at the same time… In just 4 minutes! 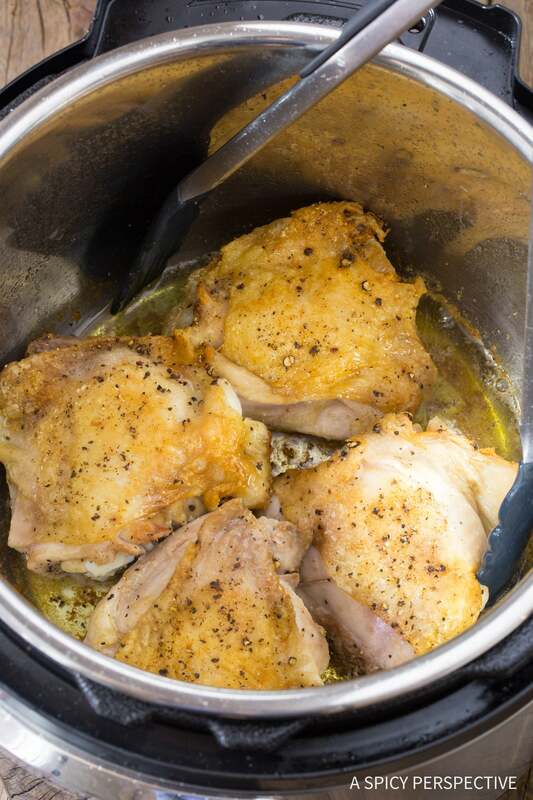 Seriously, Instant Pot Herb Chicken Orzo is so easy to make. Just sauté the chicken thighs in the pot to create some caramelization on the exterior. Next add in onions, garlic, orzo, tomatoes, and fresh garden herbs. Stir in water and position the chicken thighs on top. Then pressure cook the pasta and chicken together. 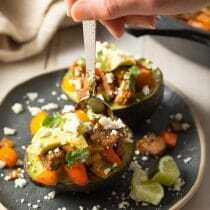 I like to stir in fresh basil leaves at the end, so you have the deep herby undertones of the pressure cooked herbs, balanced by a pop of fresh sweetness from the raw basil. This simple meal is so satisfying, it’s sure to end up on your regular dinner rotation. 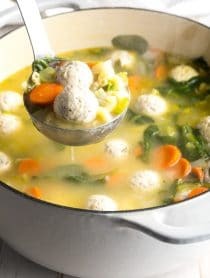 And if you don’t have an Instant Pot, it’s worth the purchase! 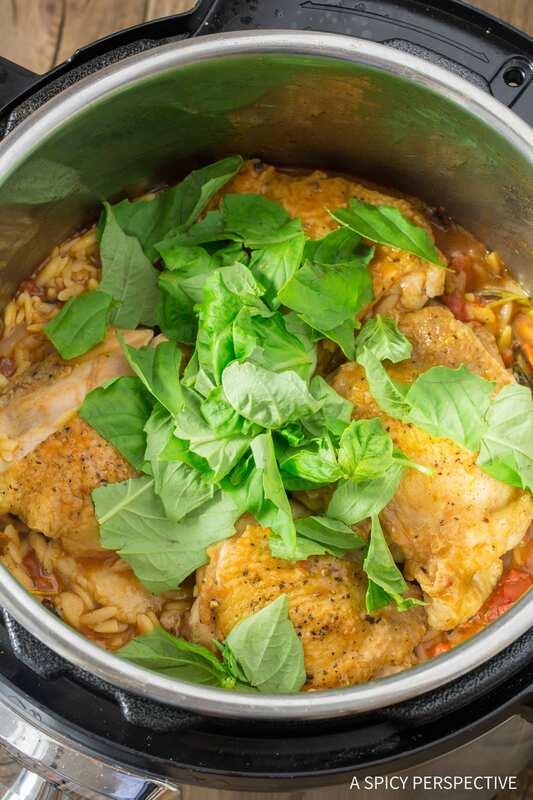 Instant Pot Herb Chicken Orzo Recipe - An easy one-pot pressure cooker meal with robust Italian flavors of tomato, rosemary, thyme and basil. Next add the onions and garlic to the pan juices. Sauté for 1-2 minutes. 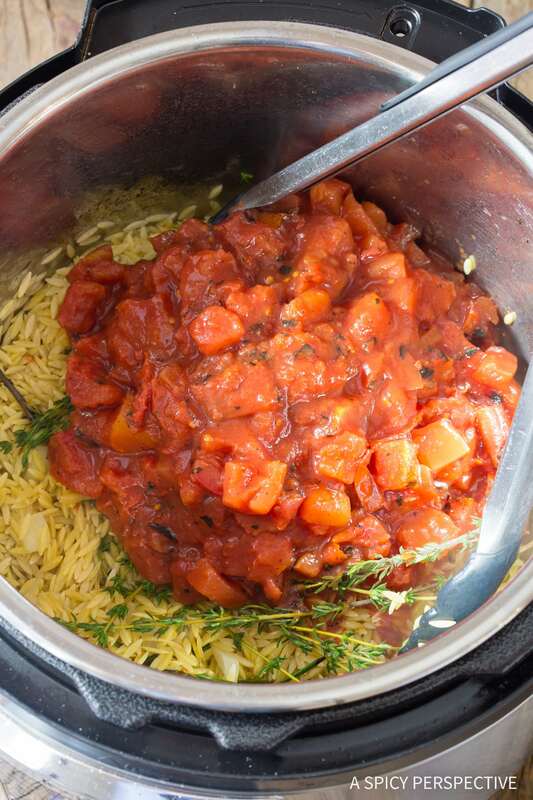 Add the fresh herbs, orzo, diced tomatoes, and water to the pot. 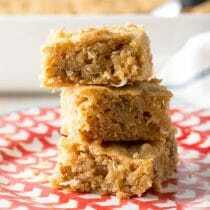 Season with 1 1/2 teaspoons salt and stir well. 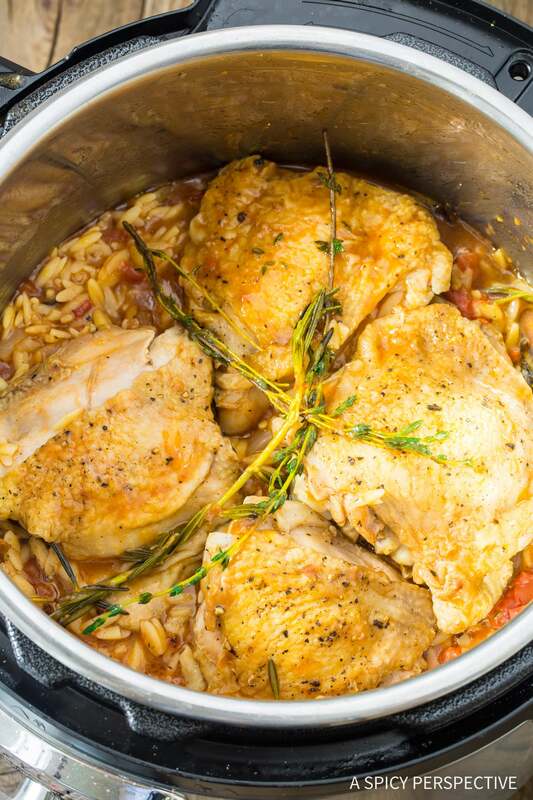 Set the chicken thighs on top of the orzo. 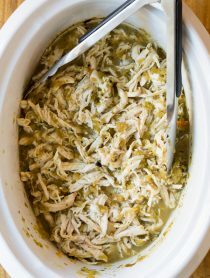 Lock the lid into place and set the Instant Pot on Pressure Cook High for 4 minutes. Once the timer goes off, turn off the Instant Pot and perform a Quick Release. When the steam valve button drops, it's safe to open the top. Remove all herb stems. Taste the orzo, and season with salt and pepper as needed. Stir in the fresh basil and serve. 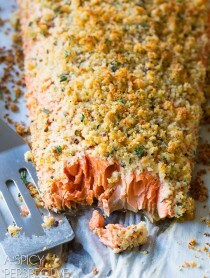 Looks delicious-do you think chicken breasts would work in this recipe? Boneless, or on the bone? Absolutely! You can swap out chicken breasts using the same cooking times. I had difficulty with the burn notice on this recipe. Even scraping the skin off the bottom of the pot, the orzo sank to the bottom and burned. 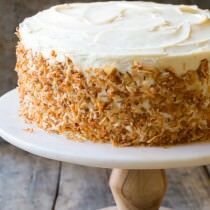 I’m wondering if it is layered differently, not stirred, but with the orzo non top of everything but the chicken maybe it won’t have the same issue? Try adding another 1/2 to 3/4 cup of water. Or you could definitely try layering it differently. If you figure something out with your Instant Pot, please report back! Could you swap out the orzo for brown rice? Yes, but it will change the cooking time a bit. Brown rice usually takes about 15 minutes on High Pressure.